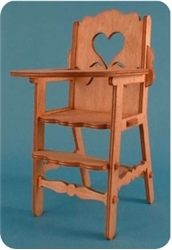 Great Doll Furniture to create memories with your children and grandchildren for them to cherish forever! 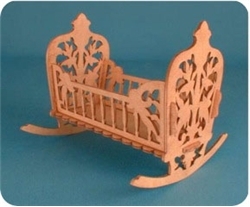 A cute miniature Cradle! Try filling with some little infant booties, a pacifier, and other goodies for a unique and clever shower gift! 7” long. 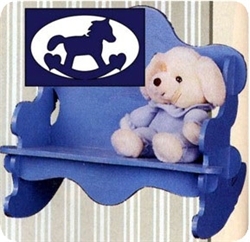 Light up the eyes of your favorite doll or teddy bear collector with this adorable country bunnies doll swing! Nearly 25” high! 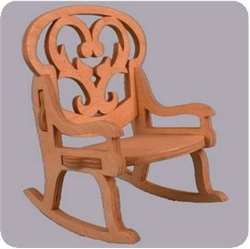 Enjoy our bench project with attractive heart design. The clear instructions will help you assemble the project in no time. 13” wide. Capture the romance of days gone by with this elegant Victorian bed - a doll collector’s dream come true! 24” high x 27” long. This precious pattern will win the hearts of your loved ones. Whether for a little girl who’s the apple of your eye or your favorite doll or teddy bear, this cradle will be a timeless treasure. 22” long. This precious pattern is designed to win the hearts of your loved ones. Whether for that little girl who’s the apple-of-your-eye or your favorite dollor teddy bear collector! 22”L x 17”H. This makes a fun display piece for any doll or teddy bear collector young and old, alike! Approx. 4”W x 6”H. Create this adorable miniature doll bench to display your teddy bears, or to add to a little girl’s doll house collection. 8” wide. 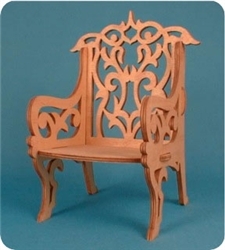 An elegant Victorian chair that’s fit for a queen! Great for doll and teddy bear collectors, or for that special doll house. 11” high. 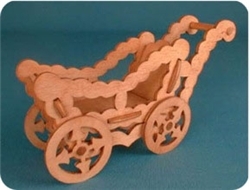 Another in our line of miniatures, this cute little baby carriage is sure to be an enjoyable addition to your home decor. 7” long. Will beautifully display any doll, teddy bear, bunny, etc. up to 21” high. 29” high. 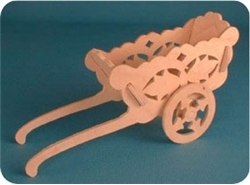 An adorable little flower cart to accessorize your garden decor, or to thrill a little girl to add to her doll house furnishings. 8” long. 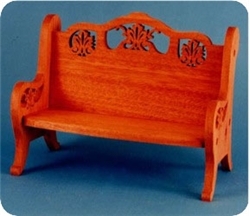 This simple style of doll bench gives it a beautiful, refined look for displaying your favorite doll or teddy bear collection. It’s sure to become a family favorite. 18” wide. This adorable country school desk has an optional basket that can be built into the top and/or seat for a multitude of uses! Over 13” high. 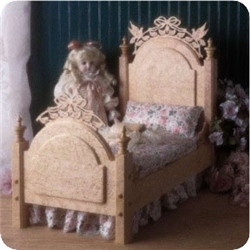 Surprise your favorite granddaughter or daughter with our elegant fretwork doll bed. Over 10” long. Simple and quick to make, our doll swing is perfectly sized for your favorite doll or teddy bear collection! 25” high. Creating this clever puzzle rocker is fun and easy for beginners as well as advanced scrollers. Simple tabs and slots make assembly a breeze by just sliding the pieces together! 11” wide.